Michael studied with Nobuko Imai, Mischa Geller and Simon Rowland-Jones at the Royal Northern College of Music, where he achieved a Gmus RNCM and PP RNCM, and was the winner of the Dearden Academic Award. 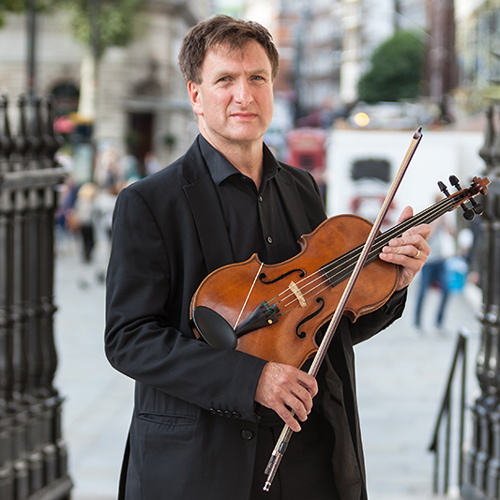 Upon leaving the RNCM, he joined the Peterborough String Orchestra where he became principal viola, playing regularly in the Chamber Ensemble and as soloist with the orchestra. Michael then moved to London, where he became a member of the London Mozart Players and a regular in all of London’s leading chamber orchestras including the Academy of St Martins, English Chamber Orchestra, City of London Sinfonia and Britten Sinfonia. He has toured and recorded extensively with these orchestras. Over the last 20 years Michael has developed a passion for teaching, alongside his playing. He held a post at Trinity College of Music, Junior Department for 14 years, and has recently taken up a post at Bromley Youth Music Trust teaching violin and viola, coaching chamber music and conducting orchestras. With his wife Julia Desbruslais, he runs the highly successful Summer Strings music courses, and coaches regularly on the Arpeggione course. Michael is a keen supporter of Arsenal football club.